The tide pools of coastal California are some of my favorite places to explore. 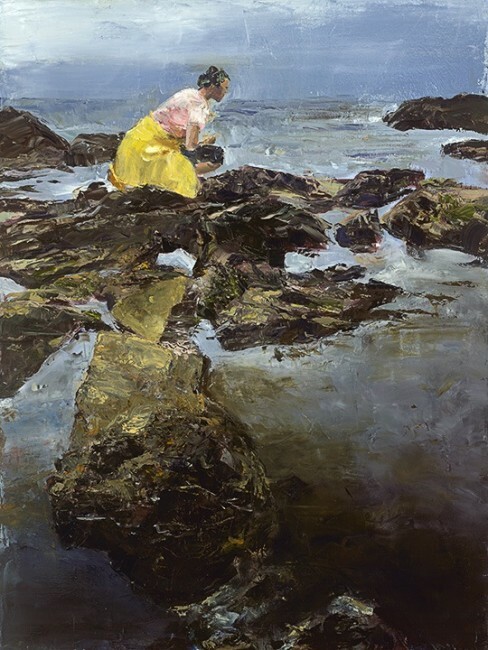 In this piece, created essentially with a large palette knife in oil, a figure climbs over the rocks through the water and bends over to take a closer look at what is living in the tide pools. Like most of my work on tide pool, this piece addresses our tendency to judge what we believe we see only by looking on the surface. Until we take a closer look and really see what is below the surface do we really understand the truth of a person, situation or in this case, that a tide pool is a plethora of life, not just a big bucket of water.